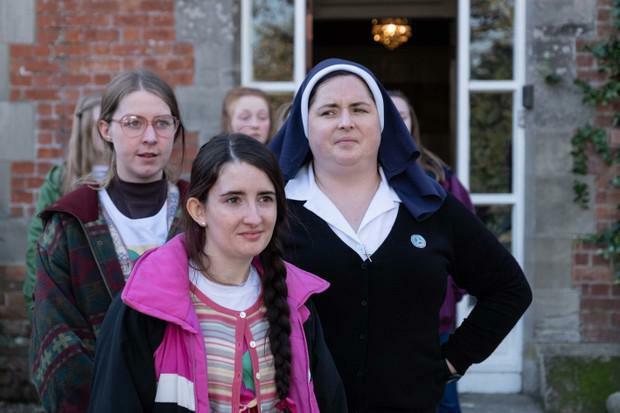 Fans of Derry Girls will be familiar with the hilarious Sister Michael memes that crop up on social media during and after each new episode, inspired by the character’s acerbic one-liners and trademark eye roll. 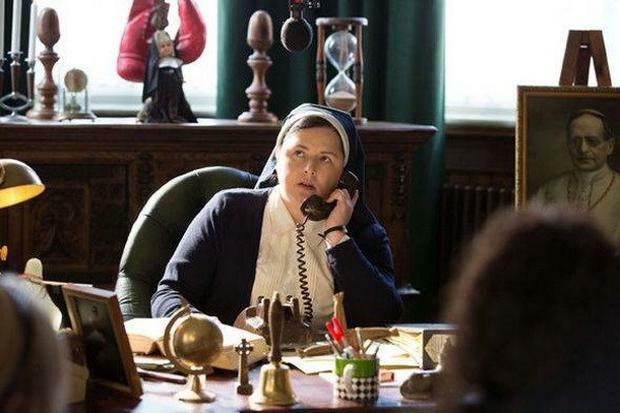 So, just one and a half seasons in to the Channel 4 hit, Sister Michael is already well on the way to being immortalised as a classic comedic character, and nobody is more tickled than the woman who plays her, Cork native Siobhán McSweeney. The mobbing is likely to continue. Created and written by Lisa McGee, the first series of Derry Girls debuted to 1.6m viewers (rising to 2.5m consolidated) and was the biggest comedy launch in Northern Ireland since viewership records began in 2002. Not bad for a 90s set comedy exploring the trials and tribulations of a group of female friends as they negotiate friendship, family life, and school against a backdrop of The Troubles. Given its initial success, Siobhán admits the cast was naturally “a bit nervous” ahead of the current season, although they need not have worried; “It’s that second album fear you have with a second series, but when we got the scripts we could see they were as good, if not better, than the first,” she says. Broadcast across the UK and Ireland on Channel 4, Derry Girls has also garnered an unlikely, perhaps, but appreciative audience in the US following the arrival of the first series to Netflix US. While there have been reports of Americans requiring subtitles to understand the accent and local Derry lingo, Siobhan calls that out as “bull****”. Some viewers in the UK and the US have revealed they knew little or nothing about the political history of Northern Ireland before watching the show. Given Northern Ireland is now in a state of flux with the shadow of Brexit and a possible hard border looming, Siobhán says she feels ‘gratified’ that the series is shining a positive spotlight on the north. “I feel really gratified it’s on at a time when, in general, the awareness of Northern Ireland is almost at an all time low,” she says. That’s not to say it’s not a barrel of laughs - it’s riotously funny, but also packs a pretty solid emotional punch on occasion, as most great comedy does. And Sister Michael is quickly emerging as a pivotal character for many viewers. “I think what I personally like about Sister Michael is what people are picking up on as well, which is her complete ‘doesn’t give a damn’ attitude, her utter freedom,” says Siobhán of her character. Although she jokes she was “nearly a foetus” in the 90s, Siobhán was actually a teenager so, like many women of her vintage who watch the show, she feels a certain nostalgia and affinity with the era and the schoolgirls’ teenage experiences. She’s amused by her younger female cast mates, who have no personal experience of the decade they inhabit in the show. “For the girls, the 90s isn’t their decade. It’s funny watching them talk about the 90s as if it’s a theme. They were going to a 90s themed party and I was like, ‘It’s just called a party!’. Now it’s a theme. When did that happen? It’s such a cliché – when did that happen!” she laughs. While she would love to play Sister Michael “forever and ever” Siobhán believes there’s a time-limit on Derry Girls given the period in which it is set and the fact that the girls are in school. Having said that Siobhán admits she would “love to play her as long as Lisa sees fit.” Her first love is theatre, which is how she made her “bread and butter” before Derry Girls came along. It’s her first major TV role having had smaller roles in The Fall, No Offence, and Lisa McGee’s previous series, London Irish. Last year was a busy one. She filmed the second series of Porters which is currently airing on Dave and she had a small role in Maeve Higgins’ feature, Extra Ordinary, which had its premiere at SXSW earlier this month. Her bread and butter came courtesy of a stint in a touring production of Kevin Barry’s Autumn Royal. Derry Girls continues on Channel 4 tonight at 9.15pm.